My title, recalling E. M. Forster’s (no relation, sadly) Two Cheers for Democracy, might be too generous. I can’t imagine mustering more than two cheers for anything. Two is probably the utter limit of my cheering. And yet, as someone who spends quite a bit of time trying to think about what early-twentieth century censorship means, there is an important grain of truth in the Slate piece that is worth preserving, even if declarations of “Mission Accomplished” feel premature. The idea of book banning conjures images of state censorship and book burning—images one can find in abundance, for instance, in Kevin Birmingham’s wonderful account Ulysses, The Most Dangerous Book; images of court rooms where lawyers make grand appeals to literary value and freedom of expression.I pass over in silence distinctions between books and literature… The scene that Michelle Anne Schingler describes, at Book Riot, however is a very different one. Schingler wastes no time in affirming “No,” book banning is not simply over. Her examples all concern libraries; and indeed as Graham contends in her piece at Slate, the most recent cases that the Banned Books website cites all concern attempts to limit or remove books from library collections or school settings. When Graham declares “we won,” that “book banning” is over, this is indeed (as Overholt suggests) an oversimplification. It imagines a single struggle, which reaches some sort of crisis, and ends. Graham is offering a narrative very close to that recounted by Charles Rembar in his memoir The End of Obscenity. Rembar was the defense attorney during many of the key 1960s obscenity trials in the United States, and his memoir wonderfully charts the erosion of state censorship in the period. Suppression of books on grounds of obscenity, Rembar suggests (I think, rightly), ends after the trials of Lady Chatterley’s Lover, Tropic of Cancer, and Fanny Hill in the United States. Starting in Roth v. United States, and culminating ultimately in the so-called “Miller Test”, American jurisprudence evolves a set of standards that have the effect of ending the censorship of books on the grounds of obscenity.In English jurisprudence, the 1959 reform of the Obscene Publications Act (which enabled publication of Lawrence’s Lady Chatterley by Penguin) plays the same role as the court cases discussed by Rembar. After those trials, it has proved essentially impossible for a book to be banned on grounds of obscenity; contract, libel, and copyright all continue to shape cultural production in important ways (the latter especially so), but obscenity and its particular brand of state-controlled book burning is indeed over. The Miller standard may justifiably be celebrated as a sort of liberal triumph. And boy, do we love to tell this story. 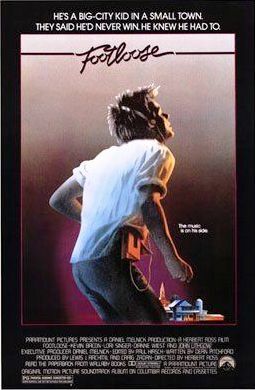 Birmingham offers a version in his account of Ulysses; we get a sort of version in movies about Allen Ginsberg’s “Howl”; or in TV movies about the Chatterley trial. Folks love this tale of heroic lawyers fighting on behalf of great works of literature, against philistine puritans—figures like Anthony Comstock or William Joynson-Hicks (more commonly called simply, “Jix”). We tell very similar stories about Elvis and his hips, or Lenny Bruce and his comedy—tales where transgression and freedom contend with (usually comicly absurd) conservatism. (We even tell a version of this story about dancing in small towns.) It’s usually a narrative of triumph, told by liberal proponents who indeed end by declaring “We won.” And, as history, it is usually an oversimplication.For one thing (and this is a hobby horse of mine), it tends to remove books from a broader media history which shapes what it means to “ban” a “book.” I have a different story of my own, about the place of literature in the changing media ecology of the long twentieth century… but that’s another tale for another time. “Banned Books Week” conflates two narratives, perhaps deliberately. It inserts present instances of political struggle which involve books, particularly (like those described by Schingler) around libraries, into a longer history of book banning. It is, in some ways, a savvy rhetorical move to align parents who want to limit access to particular titles with Anthony Comstock and similar figures (after all, who wants to be this guy). But this conflation also has the, I think unfortunate, effect of casting contemporary debates about education and the meaning of “the public” as matters of “banning books.” I think it makes more sense to understand attempts to limit access to Toni Morrison’s Beloved, not as a debate about book censorship continuous with the suppression of Ulysses or Lady Chatterley’s Lover, but as part of the same political struggle over how to teach the causes of the American Civil War, or even whether to mention evolution. These are debates about books; but more fundamentally they are debates about education and, more importantly, debates about the public. They ask not, “Should this book be legally available?”, but “Should my children learn this?” or “Should my tax dollars pay for this?” Defending against the active defunding of public goods by appealing to the “freedom to read,” seems to me, to be a tactic of ambivalent value. When “Banned Books Week” began in 1982, the heroic age of the struggle against state censorship of books in the United States was already over. In 1982, rather than the State of New York seeking to prevent folks from reading Ulysses, we find the Moral Majority complaining about works like Our Bodies, Our Selves. This concern with women’s sexuality and health is uncannily recalled when earlier this month a Knoxville parent complained about the explict references to women’s bodies in the The Immortal Life of Henrietta Lacks. Is this debate about women’s sexual health and knowledge, either in the early 1980s or now, best understood as a debate about books? Or does it have more in common with a history that, as this moment, materializes as an effort to defund Planned Parenthood? As a matter of rhetoric and political tactics, it perhaps makes sense to throw the weight of a long historical struggle against state censorship behind our own moment of squabbles in local school boards or funding lines in state budgets. We should be careful, though, that such rhetoric doesn’t lead us to mistake a fight about public education or women’s health or the rights of queer people for the right to read. Indeed, if we could add a little nuance and history to our sense of the long struggle to publish controversial books, we might even realize that the history of books and their banning is already replete with lessons for these distinct, but not unrelated, struggles (see, for instance, the case of The Well of Loneliness and its banning in England). So, two cheers for Banned Books Week and for all efforts to protect the freedom to read. The fullest possible access to the textual record is indeed a public good worthy of our time, attention, and dedication. It is not, though, the only good; it may not, at this moment, even be the most pressing one. I’ve been tinkering with the HathiTrust dataset that Ted Underwood and HathiTrust released last month.Some Links: [The Dataset]; [Ted Underwood’s Discussion of It]; [My Previous Exploration of It, Mostly Using R] The thorniest questions I’ve encountered concern how to handle/understand volumes and titles which occur in the dataset more than once (and some related issues—multivolume works, etc). I’ll try to write a quick post about those issues in the future. For now, let’s look at other ways we might explore this dataset. This sort of inference based on first names is obviously imperfect; there are cases where, for a variety of reasons, the prediction will be wrong. The suggestion that in 1819 the name George belongs to a man may be very wrong indeed if that particular George is the author of Middlemarch. For certain purposes, however, that misattribution may be exactly what we’re interested in. The simplicity of the approach can be a strength. The package, in most cases, will make the same inference—even the same incorrect inference—about the gender of a name as a reader would. This makes it ideal if you’re interested in how readers understood the authorship of the books they were reading, or how (perceived) authorial gender shaped the market for literature.Before we start taking this too seriously, Francis Beaumont’s name is detected as female (understandable, but wrong); as is Oliver Goldsmith’s (?!?!) in some years (e.g. 1792). Such a summary of the dataset is very different than, say, using the gender information inferred about a volume based on its author’s first name to train a classifier on the volume-level word counts. Such a classifier could be used on texts from outside the dataset, or on texts within the dataset where an author’s gender is unknown. One might try to use it to test Virginia Woolf’s “guess that Anon, who wrote so many poems without signing them, was often a woman” (49). That sort of project, however, which would attempt to link “gender” (and in this case what exactly that word means becomes rather pressing) not simply to a name in a metadata field, but to a vocabulary (or some other representation of language use), would begin to encounter the thornier theoretical/methodological questions that I am so happy to skirt past here. I then tallied up the number of works by men and women for each genre. (I did the tallying with Python; you can find the results of those tallies as CSVs here.) In addition to male and female, there are two other categories here: missing means a name was not provided (or, more precisely, was not detected by my script) in the HathiTrust metadata; undetected means that the gender package had not value for the “name” it was given (or, more precisely, whatever string it received from how I parsed the name). That is, missing means no name and undetected means that gender had no association for the name. (There are also columns for each of these values normalized by the number of volumes in the dataset for that year). 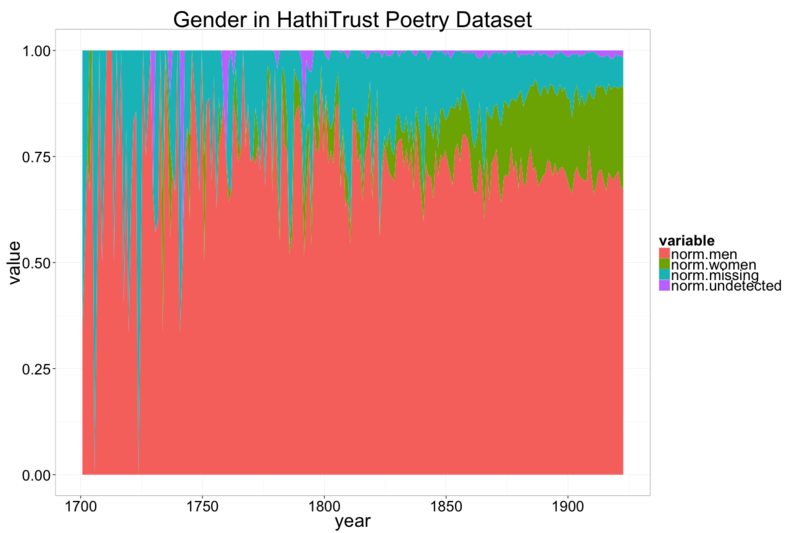 Without further ado, three area graphs representing the gender breakdown of authorship in each of the HathiTrust datasets (fiction, poetry, drama). If you right click and open each graph in another tab, they should be a bit bigger. 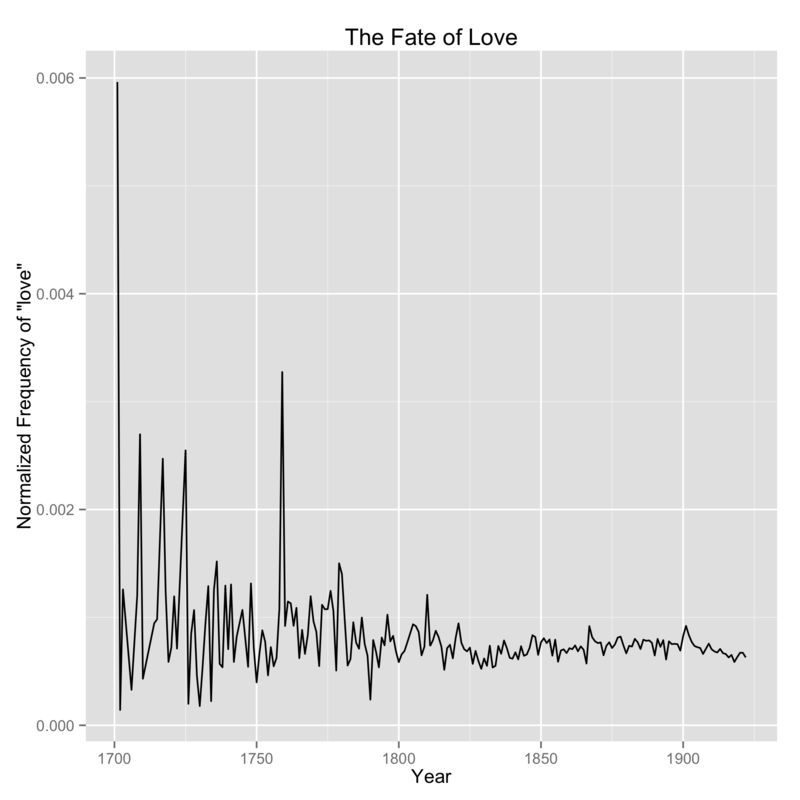 The data before 1800 is sparse and so these graphs look a little volatile. The prevalence of missing and undetected in the fiction data before 1800, however, may reflect the lack of attribution common in the late eighteenth century. “Over 80 per cent of all novel titles published in the 1770s and 1780s were published anonymously,” James Raven claims in the introduction to the first volume of the two volume The English Novel 1770–1829: A Bibliographical Survey of Prose Fiction Published in the British Isles (41). (I’ll abbreviate that BSPF for the rest of the post). So why is the author missing from these? Checking the full records, the most frequenltly occuring items in this series are multivolume collections of other works. The New British Novelists lists no author in the dataset’s author metadata; the title appears in the fiction dataset 50 times. Checking the original page images, we see that this is a series, published starting in 1820 which collects different novels by major British novelists. It includes a range of major novels, many themselves multivolume works: Clarissa, Robinson Crusoe, Humphrey Clinker, and so on. The Harvard Classics Shelf of Fiction appears to be a similar case. Is there an existing literature on these sorts of collections and their role in reputation creation/maintenance? 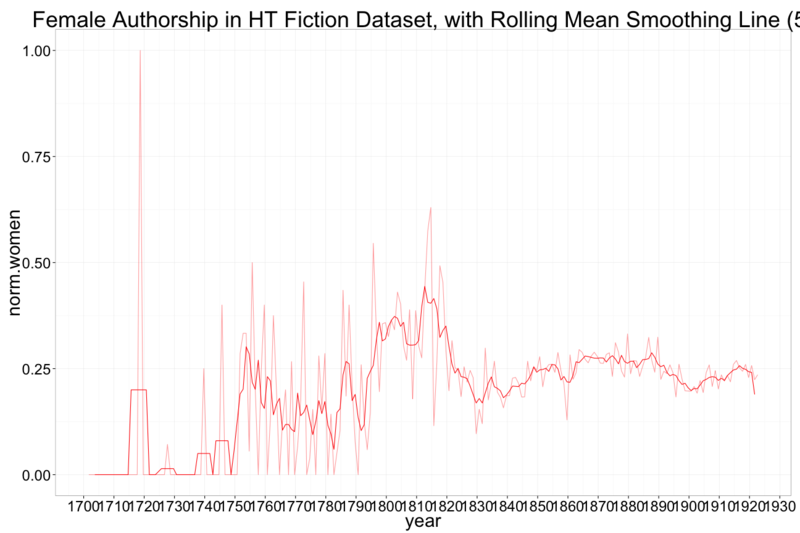 In the earlier period, there are titles (like The Infernal Wanderer) which simply lack an author; others (like Turkish Tales) lack an author in the dataset, but currently have one in HathiTrust (perhaps because this record has been updated since the dataset was exported); and quite a few don’t meet my naming convention. Works by Phalaris, [Madame d’] Aulnoy, [Mssr.] Scarron, [Mrs.] Manley, Volatire, Virgil, and many others are “missing” because when I try to splice ‘em up (relying on a comma to separate first and last names), we get nothing. Some of these authors were referred to simply by a last name and title (Mrs. Manley) and this has entered the dataset as simply Manley. A look at the names is enough to guess why gender likely had a probably with them. (There are sufficiently few names here (321 unique individual, undetected names) that I am half tempted to put together a manual reconillation for names and genders). It also provides a clear illustration of the implicit cultural construction of “data.” These “undetected” names are largely non-Anglophone names—and so the attempt to infer one culturally mediated category (gender) gets complicated by the complexities of another one (nationality). Names that are undetected are not randomly distributed through the data but are dispropotionately non-Anglophone. To more clearly see the trends, let’s look at works published under names that we have identified as female across genres; first raw counts and then as a proportion of all works published per year. The second graph is the interesting one. Among the genres, female authors are best represented in fiction, and least well-represented in drama. The trend in fiction, however, is odd—while poetry and drama show upward trends (poetry’s is slow and steady across the 19th century; drama’s rather sudden after 1900), fiction has a high point in the early nineteenth century where women represent a larger proportion of fiction writers than anywhere else in this data. 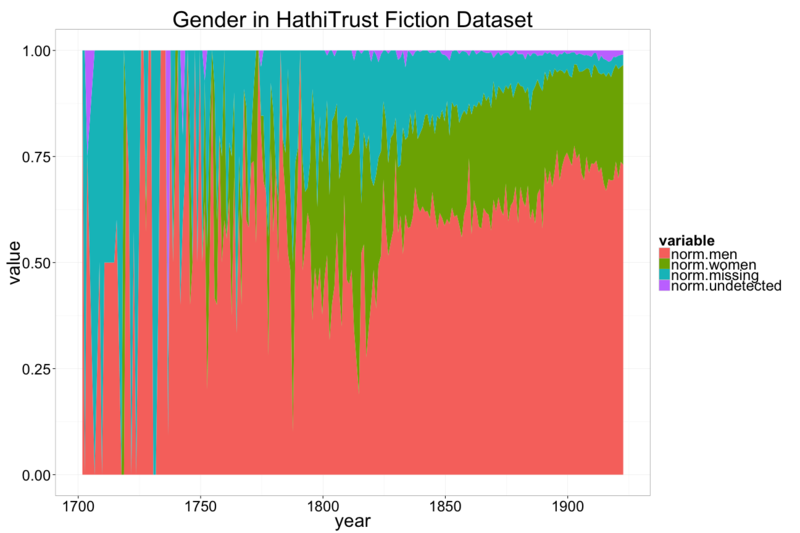 At times, early in the data, half of the works of fiction in the dataset are written by a woman (more on this figure below). Yet, over the course of the nineteenth century this proportion diminishes. When the graph ends in 1922, women represent about a quarter of the authors of each of the three genres. On twitter, I suggested that in the normalized data for fiction by women above, one sees a decline in works by women. 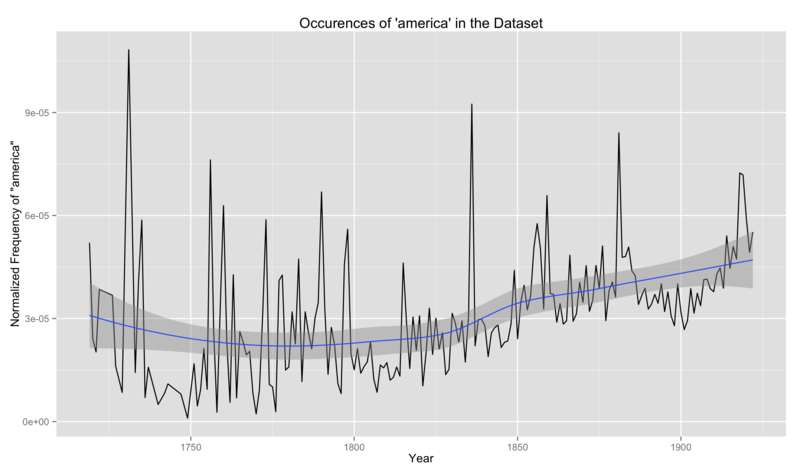 This may be consistent with the BSPF data (which, in its admittedly narrower slice, shows a decline from 1815 to 1830). To get some sense whether that’s a fair description, let’s isolate the fiction by women data, and add a rolling mean, with a a window of 5. At some point, one is reading Rorschach plots; but this plot seems to suggests two periods of downward trends from 1805–1830, and then again from about 1885 to 1900. (That preciptious drop at the end is a function of doing the rolling average running out of data). To get some sense about how reasonable these trendlines look, we might try to compare them to another source. 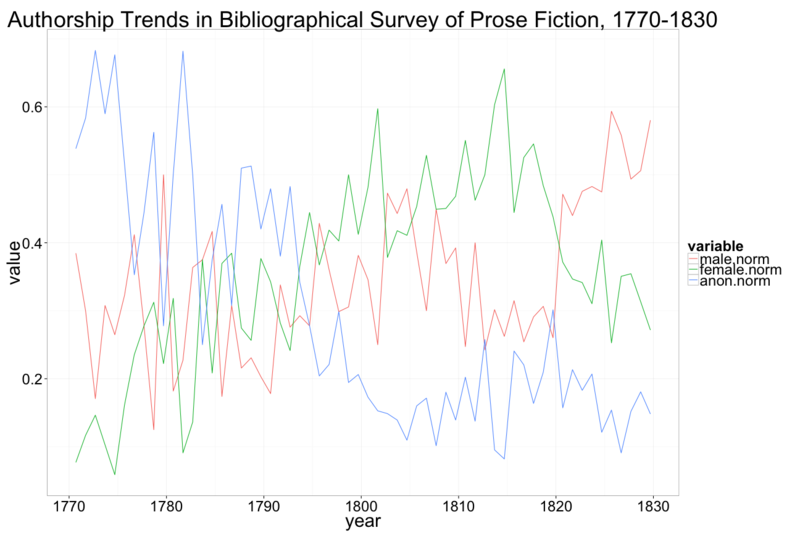 I’ve already quoted the BSPF, which offers a portrait of the authorship of novels between 1770 and 1830. The BSPF has totals based on both what is stated on title pages and in prefaces, as well as more comprehensive totals based on what the editors were able to infer about the authorship of works from other sources.For instance, if a work states that it is “By the author of Waverley, one can make additional inferences about the author’s gender. There turns out to be a significant discrepancy between what a title page, or preface, states, and what one may be able to infer about the gender of an author with just a little more knowledge. The majority of novels in this period were published without a clear statement of authorship. But if we look at the more comprehensive portrait of authorship that the BSPF offers, the story is a little different. The graph above summarizes the trends in the inferred data. It has three distinct moments—a predominance of “anonymous” or unattributed works until around 1800; the predominance of women writers during the first decades of the nineteenth century, and concluding with what Peter Garside calls “the male invasion of mainstream fiction” (2:63). Garside notes, for instance, “the publication of Jane Austen’s novels was achieved not against the grain but during a period of female ascendancy” (2:75). 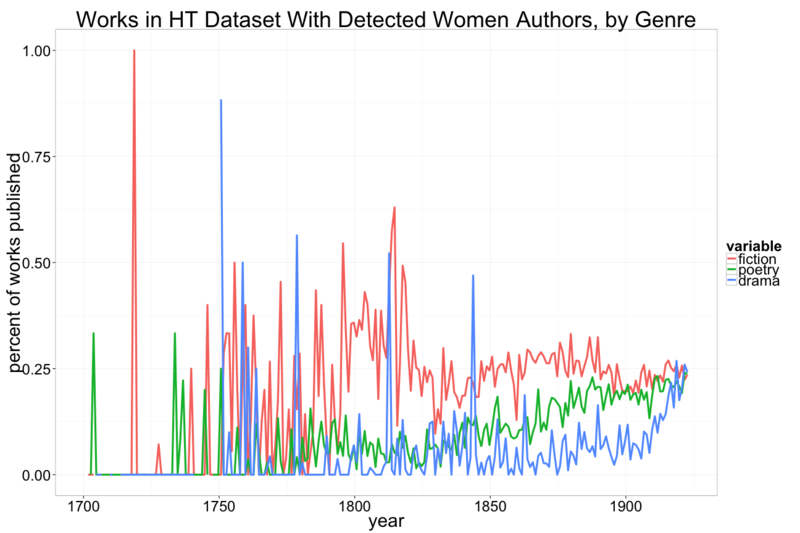 This data suggests that authors of novels were most likely to be, in this order, anonymous, women, and then men. The three waves visible in the graph above, however, is based on the inferences that the editors of the BSPF made to ascertain the the gender of the authors in their bibliography. The metadata available on title pages—of the sort that’s compiled in the HT metadata—often lacks information that might otherwise be available to most readers. 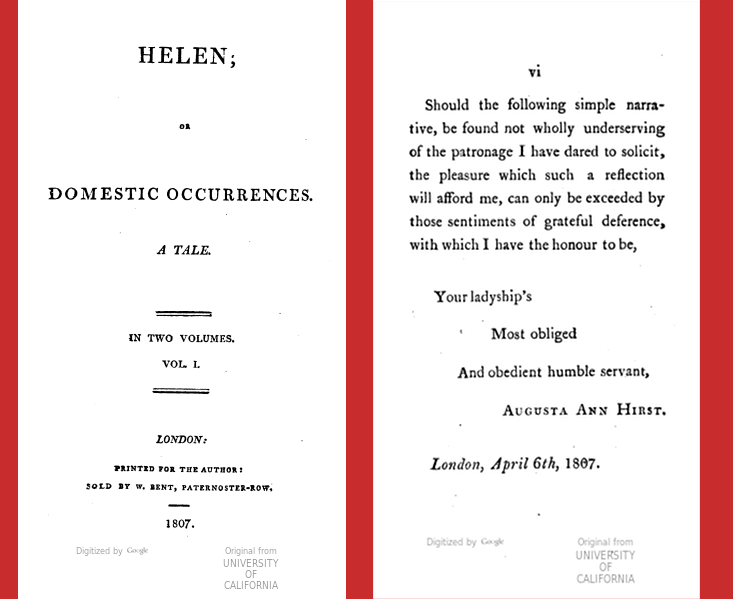 HathiTrust has a copy of Helen, or, Domestic Occurrences: A Tale (though it is not included in the fiction dataset). And indeed its title page lacks the author’s name, though one can discover it in the dedication. Looking only at what one can infer about the authorial gender of works from the information available on the title page, most works would be “anonymous,” even if (some) contemporary readers may have been able to see through that that anonymity. Note the difference between the trends in authorship when we look only at information available from examining “proper names from title-pages and prefaces only” with the inferred conclusion (all this data is taken from the wonderfully comprehensive BSPF). 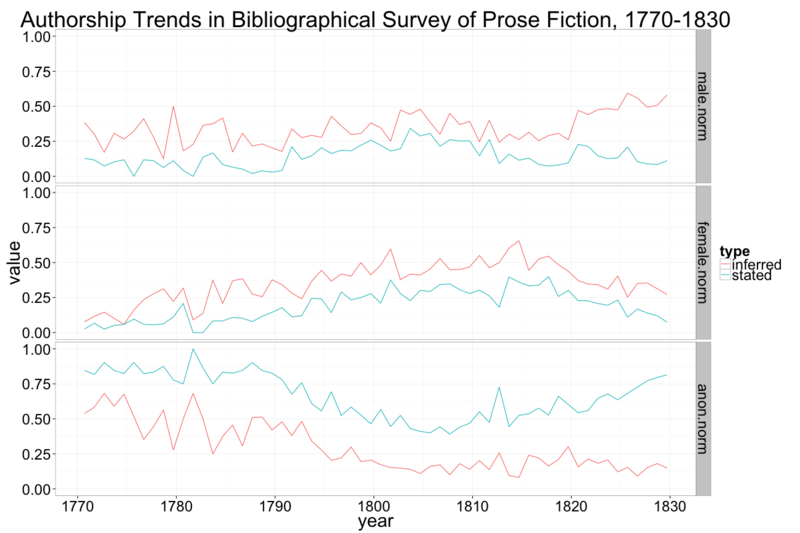 The inferred trends for both male and female authorship are significantly higher than their stated counterparts (these terms, inferred and stated are my clumsy language; for anyone interested, The English Novel, 1770–1830 really is an invaluable, if imposingly weighty, resource). There are perhaps two interesting trends here. 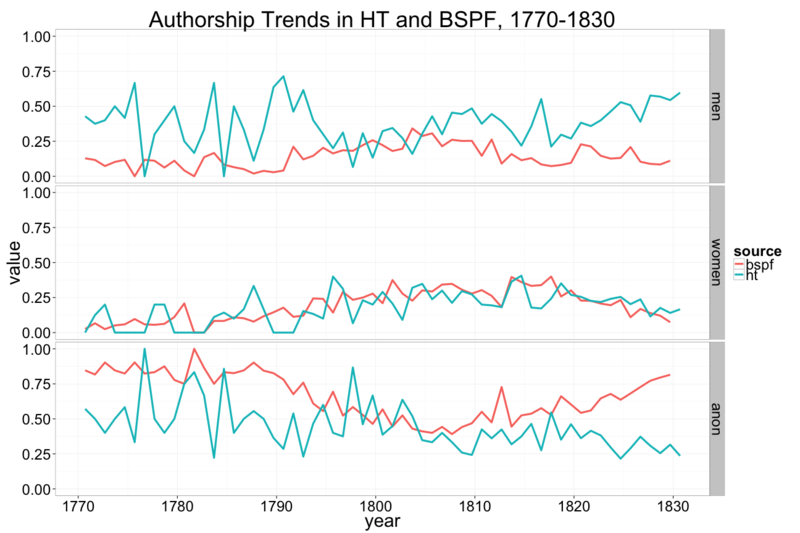 The decrease in anonymous authorship at the start of the nineteenth century coincides with a rise in female authorship; female authorship is more public than its male counterpart. After 1820 one sees a sharp rise in male authorship—which is itself a rise in anonymous male authorship. 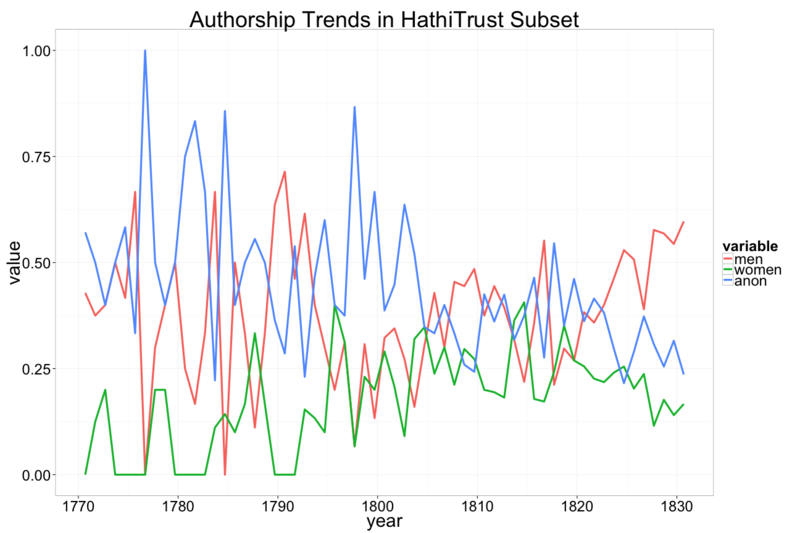 Using the method described above to infer authorship in the HathiTrust dataset should produce results similar to the raw, stated dates in the BSPF data. There are, though, a few differences to account for first. For one, James Raven’s and Peter Garside’s introductions to the two volumes of the Bibliographical Survey of Prose Fiction offer summary counts of “New Novels” but the HathiTrust data represents books owned by libraries. To be able to compare to the BSPF data with the HT data, we need to eliminate reprints (we only want new novels) and we need to count works, not books (so, multivolume works should be counted as a single work). I’ve tried to do this rather crudely by creating for each work in the HT fiction dataset an “ID” which consists only of a work’s title and it’s author.Using title alone as an ID could, in theory, lead to a problem if two works have the same title—which is actually quite common for multivolume sets, like The Novels of Walter Scott and the The Novels of Charles Dickens, and similar My script loops over the works in the metadata summary, counting a work as “new” only if we haven’t seen its ID before. Because we look only at title and author (and not enumcron), we also only count one volume from a multivolume work (though, as I mention above, this problem is quite a bit thornier than I’m allowing here). Second complication: geography: the HT dataset is culled from American libraries, whereas the BSPF data is focused on works published in “the British Isles.” Well, that raises an interesting question (digression ahead! 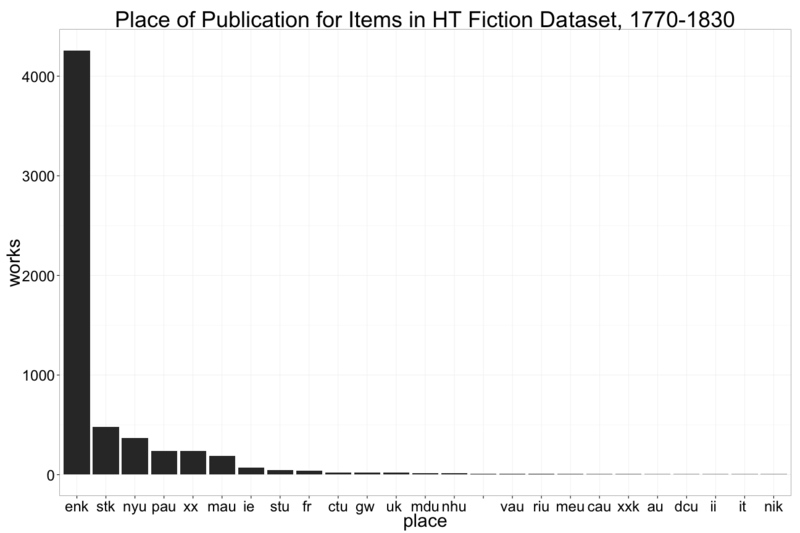 ): where were fiction volumes in the HathiTrust dataset published? For this period the top two locations are England and Scotland. It seems unlikely, therefore, that any differences between the BSPF and the HT datasets could be attributed to the different geographical coverage of the two datasets. 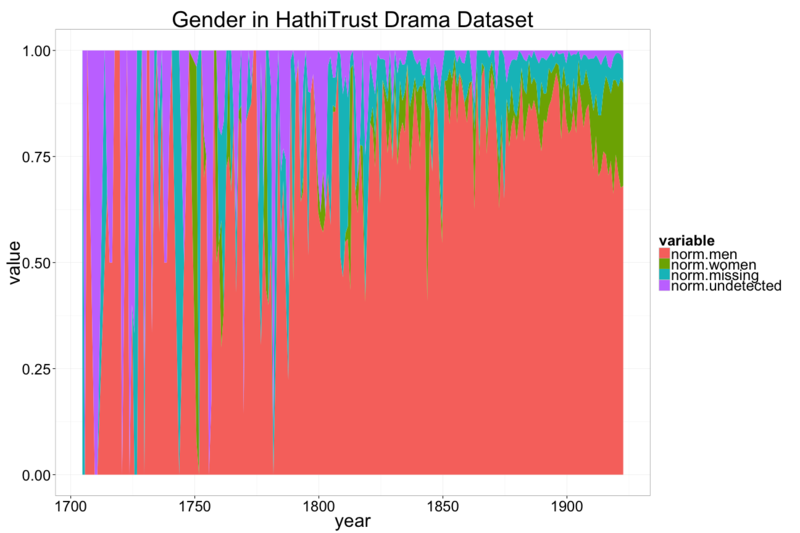 But, just to be sure let’s extract only the works from the fiction dataset published in England and Scotland and Ireland between 1770 and 1830, and compare the gender breakdown one last time. To create this subset of the HT summary metadata, I’ve used some Python that tries to more closely match the parameters of the BSPF data: it covers only works published between 1770 and 1830, published in England, Scotland, or Ireland, and it tries represent only “new works.” The Python that did this is here; the summary of the data is here. We can get some sense of how the HT data compares to BSPF by plotting them together. 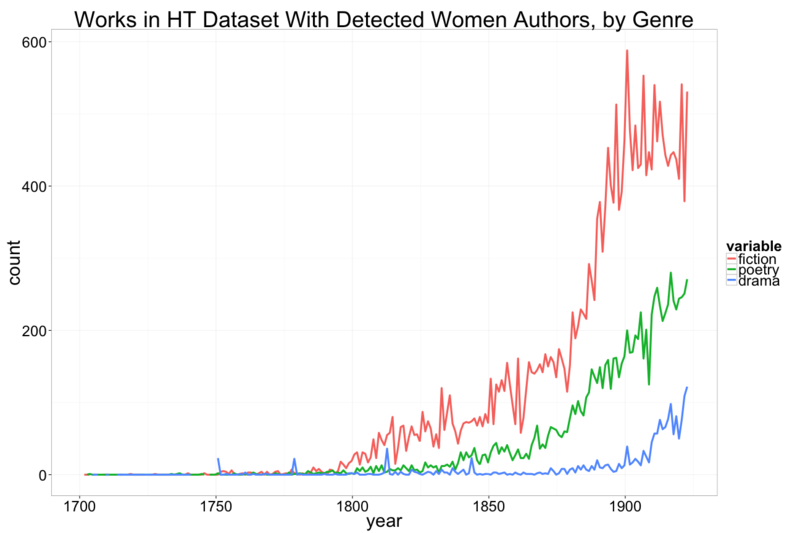 The data for female authorship in the two datasets (or rather, in the BSPF data and my weird manipulation of the HathiTrust data) seems, to my layman’s eye, surprisingly consistent. Of course, recalling the difference (often of between 10 and 20 percentage point) between authorial gender as determined by consulting title pages/prefaces with what the BSPF editors were able to infer, one might suggest (at least for the period 1770–1830) that the summary I offered above significantly under represents female authorship. The data for male and anonymous authorship is much less consistent; BSPF reports more anonymous texts and my analysis of the HT metadata; while the HT data reports more male writers. I basically don’t understand why this would be so—I would have expected, if anything, the opposite. The anonymous line for the HT data in the above graph combines both missing authors and undetected, treating as anonymous anything that couldn’t be coaxed into another category; if anything, it should overrepresent anonymous writers. Perhaps this reflects something about the underlying data; or perhaps something about the way I carved up first names. For now, I just don’t know. So, here ends our amble through the data. Raven, James et al. The English Novel 1770-1829: A Bibliographical Survey of Prose Fiction Published in the British Isles. 2 vols. New York: Oxford University Press, 2000. Print. I’ve been trying to think intelligently about the place of quantitative data in literary studies, especially in light of two excellent posts, one by Andrew Goldstone, the other by Tressie McMillan Cottom, both responding to this review by Ben Merriman. But before I could even try to say something interesting in response, Ted Underwood announced that he was making available “a dataset for distant-reading literature in English, 1700-1922” (here is a link to the data). This post is a look at that data, mostly using R. I have, essentially, nothing thoughtful to offer in this post; instead, this is an exploration of this dataset (many, many thanks to Ted Underwood and HathiTrust for this fascinating bounty), studded with some anticlimaxes in the form of graphs that do little beyond give a sense of how one could begin to think about this dataset. With the exception of a bash script (which may, though, be the most repurposable bit of code), everything here is done in R. I don’t like R, and I’m not very good with it,I think R’s datatypes are what make it a challenge; lists in particular seem to materialize out of nowhere and are frustrating to use… but it is great for making pretty graphs and getting an initial handle on a bunch of data. I try to comment on, and explain, the code below (often in comments)—though if you’ve never looked at R, this may seem really weird. I also may have made some horrible mistakes; if so, please let me know. 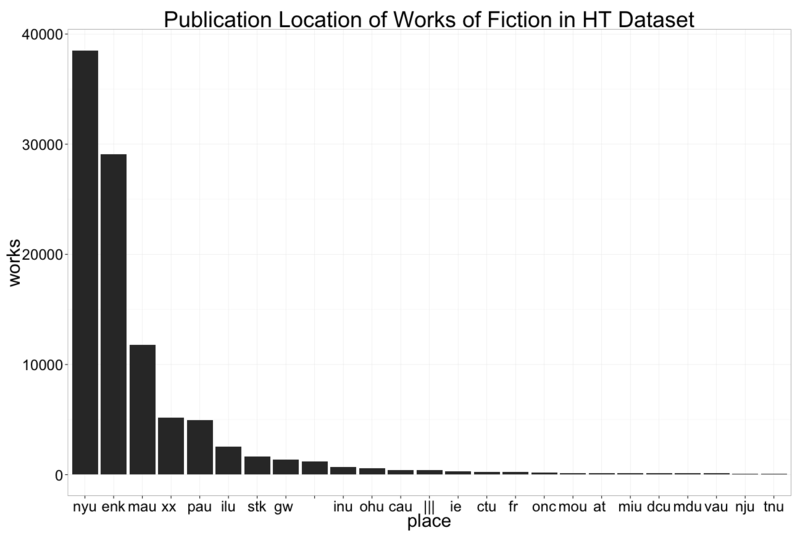 Underwood calls this dataset “an easier place to start with English-language literature” within the HathiTrust dataset. I had poked around the HathiTrust data before, and it really is a very complicated undertaking. This dataset that Underwood has provided makes this much much easier. fiction_metadata.csv: 17 megabytes, containing author, title, date, and place for each work of fiction. It also includes subjects, an id for HathiTrust (htid), and other fields. 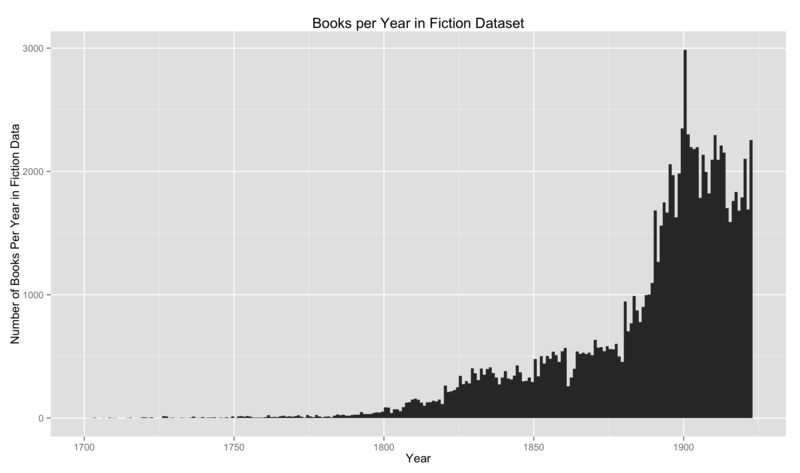 fiction_yearly_summary.csv: 35 megabytes, containing token frequencies. The first 20 lines look like this. So, let’s begin, by loading our plotting library (ggplot) and the CSV file with the fiction metadata file fiction_metadata.csv. # Let's look at how many items we have for each date. 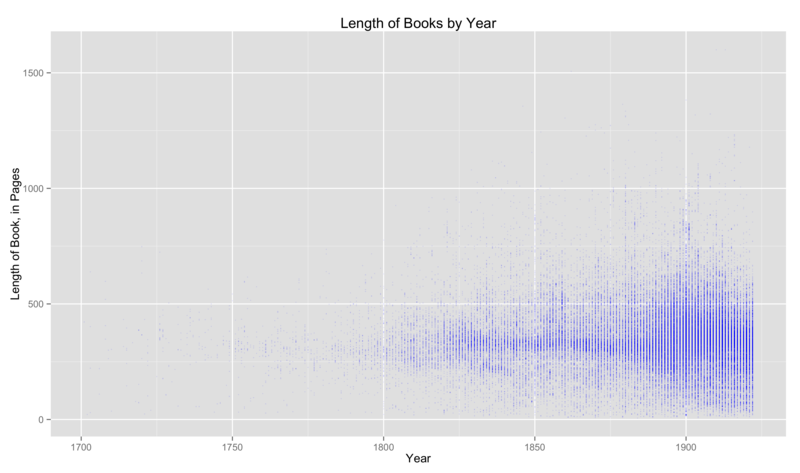 This gives a sense of just how few books from before 1800 are in this dataset. That is, 101948 volumes total, 1129 of which were published prior to 1800, or about 1%. The number of volumes appearing in the dataset per year tends to increase constantly—with a few exceptions. That dip around 1861-1864 may be a result of particularly American factors influencing the dataset; and perhaps it is war again accounts for some of the dip at this period end—though that dip seems to begin prior to 1914. The length of each volume is contained in the totalpages field in the metadata file. Let’s plot the length of works of fiction over time (so, plot date by totalpages). Interesting. It seems that, in the mid-eighteenth century near the dawn of the novel, works of fiction were around 300 pages long. 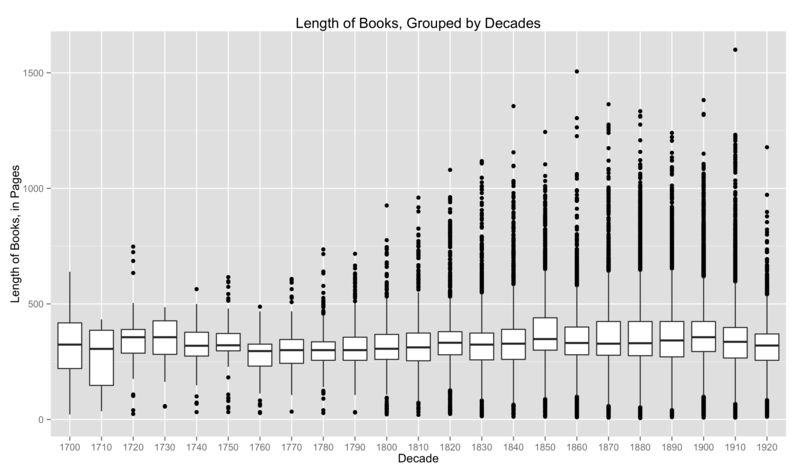 Their length diversified over the course of the novel’s history, as novels grew both longer and shorter as the possibilities for fiction widened, perhaps as a function of increased readership stemming from both the decreasing cost of books and the increasing rate of literacy. Well, not really. Matthew Lincoln has a very nice post about the dangers of constructing a “just-so” story (often to insist that this graph tells us “nothing new). But there are at least two problems with the interpretation offered above—one broad and one more specific. Broadly, it is worth reiterating the danger of mistaking this data for an unproblematic representation of any particular historical phenomenon (say especially readership of novels). Underwood describes the dataset carefully as representing works held by ”‘American university and public libraries, insofar as they were digitized in the year 2012 (when the project began).’“ And, of course, lots of other things which would be relevant to an investigation of fiction—think of pulp paperbacks and similar forms—will not be in that sample, because they were often not collected by libraries. (Likeiwse, as Underwood notes, pre 1800 books are more likely to be held in Special Collections, and therefore not digitized). # This helper function will convert a year into a "decade"
# as a "factor" (an R data-type). # a list, and I'm not very good at R, so that's how I got it to work. This plot confirms that, indeed, we see a greater range in the lengths of works of fiction (so my inference from the previous graph is not completely wrong). But a box plot clarifies what is, to me, a surprising constancy in the length of the works collected in this dataset. The apparent increase in variability in length is real—but it is not the most, or the only, salient feature of this data; this fact is better captured in the second graph (the box plot). 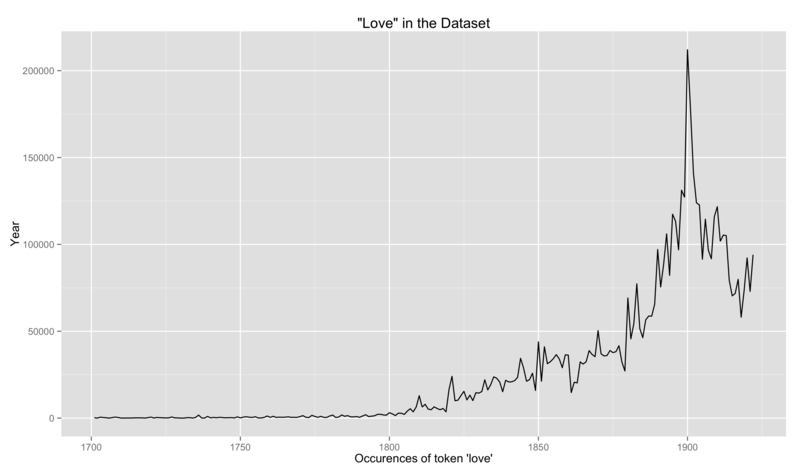 The file fiction_yearly_summary.csv contains the per-year frequencies of the top 10,000 most frequently occuring tokens in the fiction dataset. We can chart the fluctuations of a term’s use, for instance, across the period. So, let’s normalize by using DICTIONARYWORD. # Let's simplify this dataframe to just what we're interested in. # And rename the termfreq column to "total"
Well, that look’s about right. Just for fun, let’s try a different term, one that is something less of an ever-fixed mark, but which perhaps alters its relative frequency when it historical alteration finds. # We subset the term we're interested in. Not sure there’s much surprising here, but okay, seems reasonablish. Now, what if you want to look at terms that don’t occur in the top 10,000. Then, you need to dig in to the files for individual volumes. For simplicity’s sake, I’ll look only at one set of those files, representing volumes of fiction between 1915 and 1919, which I’ve uncompressed in a subdirectory called fiction_1915-1919. I’ve been using R for everything so far, and I imagine you could use R to loop over the files in the directory, open them up and look for a specified term. As someone who finds R idiosyncratic to the point of excruciation, this doesn’t sound particularly fun. R is great when you’re manipulating/plotting data frames—less so when doing more complicated tasks on the filesystem. So, to extract the information we want, I’ll used a simple bash script. # storing just the number of occurences in result. Those gibberish-looking strings (bc.ark+=13950=tk19k4r10s) are HathiTrust IDs. Then you get a comma, and after the comma the number of times the term appeared in the file… unless it didn’t appear, in which case you just a blank. This will only work on unixy systems—Linux, OSX, or (I assume) cygwin on Windows. When a token does not appear in file, this script outputs the htid, a comma, and then nothing. That’s fine—it’s easier to handle this after we’ve imported the resulting csv (to, say, R) than it would have been to write some logic in this script here to output 0. Also, this crude method is probably faster than doing it within R or Python and is certainly not slower. It could be speeded up by doing something fancy, like parallelization. To search through the 8656 files of fiction_1915-1919 for one term took 1 minute and 12 seconds—a totally managable timeframe. Assuming that rate (processing, say, 120 files/second) is roughly constant across the dataset of roughly 180,000 volumes, it should be possible to use this method to search for a term across all the volumes in the dataset in roughly 25 minutes, give or take. That is, of course, based on doing this on my laptop (with a 1.8Ghz Core i5 CPU), no parallelization (though this should be an eminently parallizable task—like really). Not fast, but totally managable. So, assuming the script works… back to R.
# values. Here we replace them with zeros. 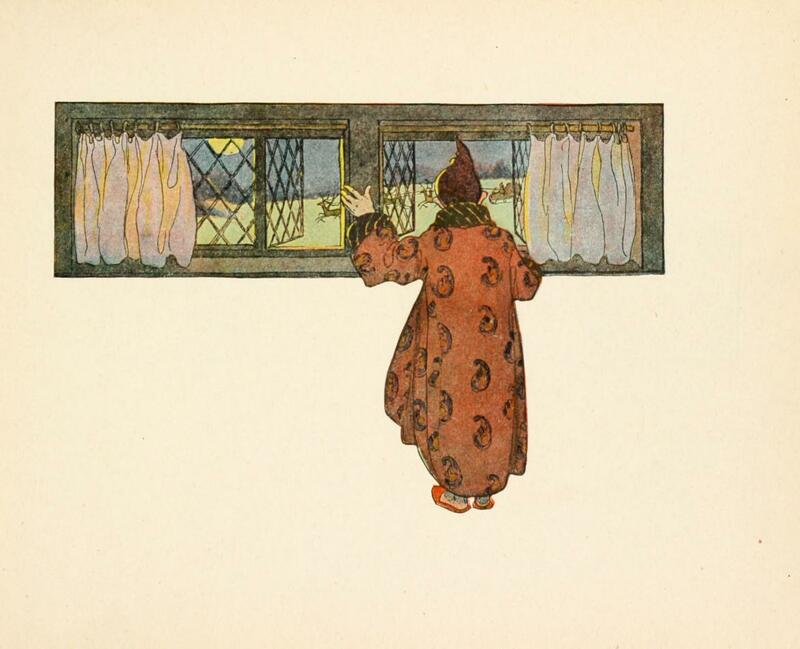 Right now, though, all we have is HathiTrust IDs and frequencies of our term (or terms). We have no information about date, or title. So let’s get that information from the metadata files we’ve worked with earlier. # merge based on htid. # merge those with our dataframe based on date. # Merge yearly totals with our main dataframe based on date. >  "date"          "htid"          "gramophone"    "film"
>  "typewriter"    "recordid"      "oclc"          "locnum"
>  "author"        "imprint"       "place"         "enumcron"
> "subjects"      "title"         "prob80precise" "genrepages"
> "totalpages"    "englishpct"    "datetype"      "startdate"
# the occurence of our terms and their date. 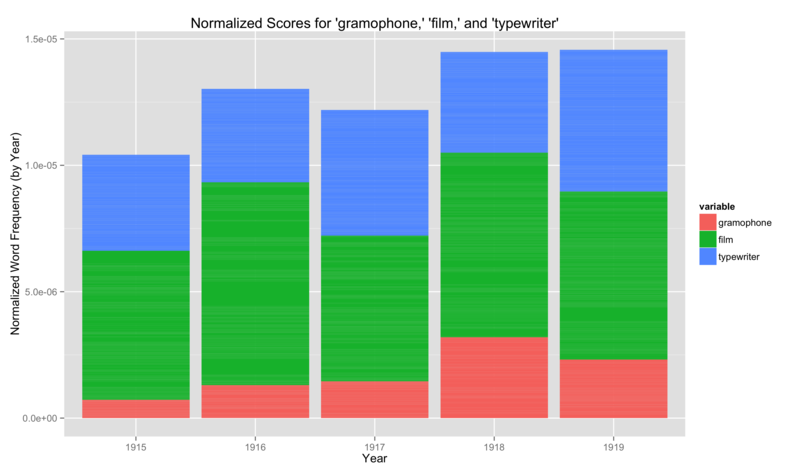 Okay, looks good—there are our 8655 volumes, each with date of publication, the occurences of our three search terms (gramophone, film, and typewriter), and the total number of DICTIONARYWORDs for that year. Note that each row still represents a single volume—but we’ve discarded author, title, htid, etc. We’ve also added the total dictionary words for a volume’s year to each row (note the repeated totals in those first 1915 volumes), which is grossly inefficient. 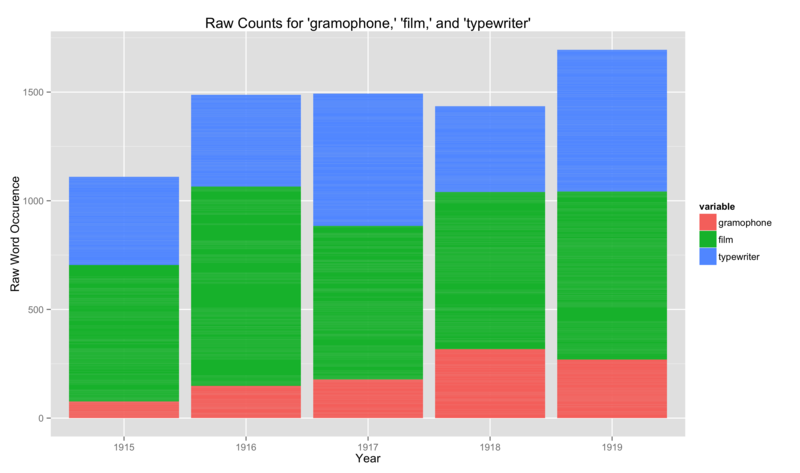 All this, however, is in the interest of simplicity—so that we can easily plot the relative occurences of our selected terms (here, gramophone, film, and typewriter). In order to make this data easily plottable, we need some additional R tricks: we need to reformat our data from a “data frame” to a long “data matrix” (using the melt function). Then we can create a stacked bar graph of terms per year. Let’s start by plotting our raw counts. library(reshape2) # For melting data. library(ggplot2)  # For graphing data. # This next is necessary b/c R throws an error otherwise. # Create a "long" format matrix, from our raw counts data. These are, though, raw counts. To normalize, we can divide the counts for our terms by the total and plot the result. # beginning with out simplified data. # the raw count in each row by the total in each row. # How does it look? # process again by creating a matrix. Normalization makes some minor adjustments, but pretty similar. Not sure I would want to make any claims as to the importance or meaning of these graphs. They’re over a short historical span, and so far lack any richer contextualization. Like I said, for now, anticlimaxes. Dennis Tennen and Grant Wythoff’s Sustainable Authorship in Plaintext Using Pandoc and Markdown (This latter I especially recommend). But Markdown, as it stands, has some drawbacks, which become acute when you are trying to extend it to cover the needs of academic writing (or, say, as a transcription format for texts). What I will describe as “problems” all stems from the fact that Markdown remains essentially a simplified syntax for HTML. A tool like Pandoc, which has a special (and especially powerful) flavor of Markdown all its own, helps reduce the borders between document formats. With Pandoc it becomes easy to convert HTML to LaTeX, or Rich Text Format to Word’s .docx. It could easily feel like Markdown is a universal document format—write it in Markdown, and publish as whatever. That is a lovely dream—an easy-to-write plaintext format that can easily be output to any desired format. In reality, though, Markdown (even Pandoc’s Markdown) remains yoked to HTML, and so it suffers from some of its problems. The problem I encounter most frequently in HTML (and in Markdown) concerns nesting a block quote within a paragraph. In short, can you have a block quote within a paragraph? If you’re writing HTML (or MarkDown), the answer is no—HTML treats “block quotes” as block elements; this means that one cannot be contained within a paragraph (this restriction does not exist in LaTeX or TEI). Yet, what could be more common in writing on works of literature? Representing poetry presents its own problems for HTML and Markdown.By contrast to the challenge presented by the mere fact of poetry, note the many syntaxes/tools available for fenced code blocks, syntax highlighting, and so on; Markdown, for now, remains of greatest interest to software developers and so reflects their habits and needs. (Note: If you’re looking for practical advice, you can easily represent poetry in Pandoc’s markdown using “line blocks”; this is not a perfect solution, but it will do for many needs). On the CommonMark forum, some folks have proposed additional syntax to fix the latter problem, and capture some of the semantic distinctions mentioned above (indeed, following the discussions over there has helped sensitize to me some of the challenges and limitations of markdown as a sort of universal format donor). So, some of these issues could be resolved through extensions or modifications of Markdown. Yet, given these deficits in Markdown, I wonder if it isn’t worth asking a more basic question—whether the plaintext format for “academic” writing should be so tightly yoked to HTML? If Markdown is, fundamentally, a simplified, plaintext syntax for HTML, could we imagine a similar, easy-to-write, plaintext format that wouldn’t be tied to HTML? Could we imagine, say, a format that would represent a simplification of syntax, not of HTML, but of a format better suited to the needs of representing more complex documents? Could we imagine a plaintext format that would be to TEI, say, what markdown is to HTML? Such a format would not need to look particularly different from Markdown. Its syntax could overlap significantly; as in Pandoc’s Markdown format, file metadata (things like title, author, and so on) could appear (perhaps as YAML) at the front of the file (and be converted into elements within teiHeader). You could still use *, **, and () as your chief tools; footnotes and references could be marked the same way (you could preserve Pandoc’s wonderful citation system, with such things represented as <refs> in TEI). I like writing in plaintext, but I don’t love being bound by the peculiarities that Markdown has inherited from HTML. So, it is worth considering what it is that people like about Markdown. I suspect that most of the things people like about Markdown (free, easy to write, nonproprietary, easily usable with version control, and so on), have little to do with its HTML-based document model but stem from its being a plaintext format (and the existing infrastructure of scripts/apps/workflows around markdown). TEI provides an alternative document model—indeed, a richer document model. Imagine a version of Pandoc that uses TEI (or a simplified TEI subset) behind the scenes as its native format. Folks often complain about the complexity and verbosity of TEI (and XML more generally), and not without reason. I would certainly never want to write TEI; but a simplified TEI syntax that could then take advantage of all the virtues of TEI, that would be something. Recall these lines from Clement C. Moore’s “A Visit from Saint Nicholas,” (alternately titled “The Night Before Christmas” or “‘Twas the Night Before Christmas”), first published in 1823. See wikipedia page for some notes on contentions with regard to its authorship. But, exactly how miniature is this sleigh, and how tiny are these reindeer? 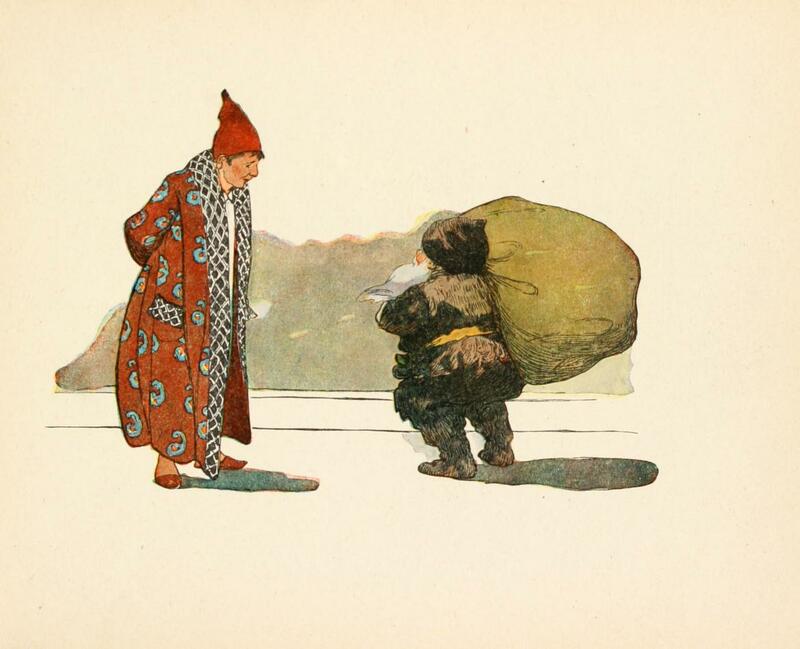 While Moore’s poem did a lot to consolidate the mythology of Santa Claus, one thing that has not remained of Moore’s Saint Nicholas is his height. 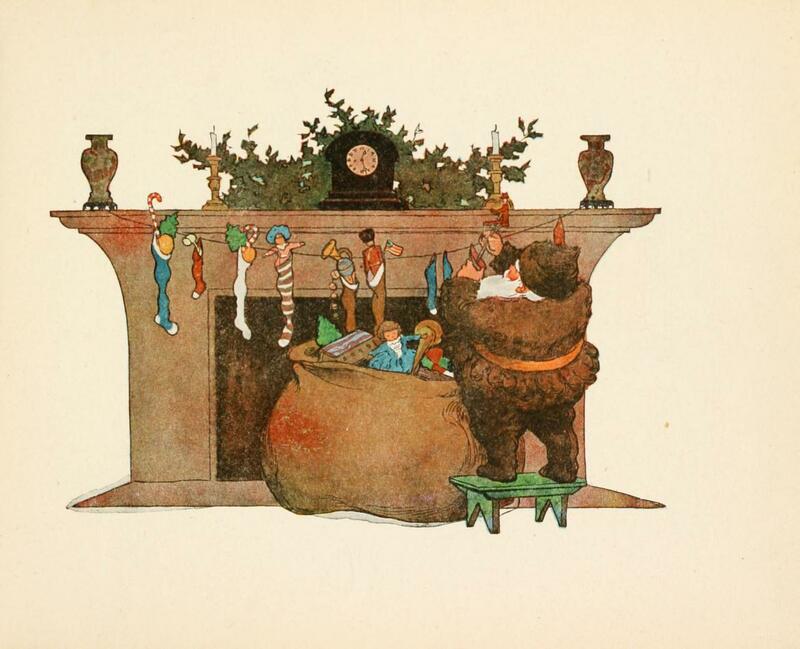 Recalling this insistence on the tinyness of Santa, much of the confusion around his movement through chimney flues is eliminated. But it also lends a different stress to the comparison of the elf’s nose to “like a cherry” or of his “little round belly” that shakes “like a bowl full of jelly.” At stake here is not simply nose complexion nor belly texture, but size. 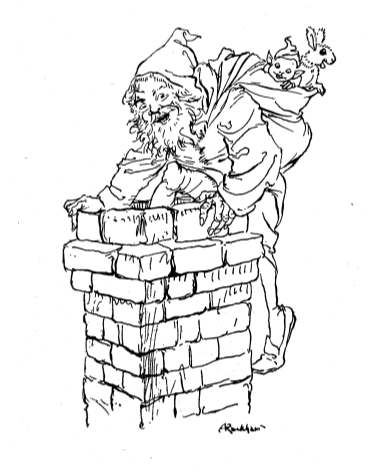 You can find more Santas at the Public Domain Review, including a gun-toting, WWII Santa, or listen to the poem on wax cylinder . For older posts see the archive.